THE OCEAN streams instrumental version of ‘Pelagial’ in its entirety exclusively via Spin Magazine! In celebration of its forthcoming release, just three weeks away, Spin Magazine is currently streaming the instrumental version of THE OCEAN‘s Pelagial in its entirety! Written, recorded, and intended to-be-performed-live as one single 53-minute piece of music, Pelagialis a multifaceted conceptual musical voyage that begins at the surface of the ocean and plunges through all five pelagic depth zones: epipelagic, mesopelagic, bathyalpelagic, abyssopelagic, and hadopelagic. In synch with diminishing light and increasing pressure as one dives or sinks deeper into the ocean, the album begins rather light and progressively gets heavier and slows as the band reaches the unfathomable depths of the hadopelagic zone, characterized by complete darkness and a thousandfold increased pressure as compared to surface level. The tracks, or episodes, are connected by interludes of underwater sounds and samples taken from old submarine movies, which give the album a claustrophobic "Das Boot"-kind of atmosphere. "There are track marks, and there are actual songs built into this larger structure, but the whole album is a journey rather than a number of loose tracks…some riffs appear in the first two minutes of the album and then reappear 30 minutes later," comments guitarist Robin Staps. It’s an experience that will reward repeated listens. Delve into the sonic depths of Pelagial, courtesy of Spin Magazine, HERE. 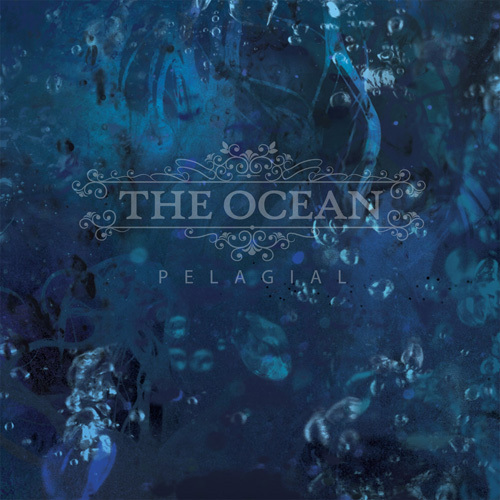 Pelagial was mixed and mastered by Jens Bogren (Opeth, Katatonia, Witchcraft) at Fascination Street Studios in Örebrö, Sweden, and firmly stands as THE OCEAN‘s deepest, most challenging entry to their winding catalog of sound exploration. Pelagial will be released as a double CD, which includes both vocal and instrumental versions of the album, on April 26th/29th in Europe. To check out the first single Bathyalpelagic II: The Wish in Dreams, the artwork and the pre-order surf over to http://www.metalblade.com/theocean. At the same location you will find the second in a series of studio video diaries. Watch singer Loic Rossetti tracking vocals and talking candidly about the near paralysis of his voice. In related news, THE OCEAN will kick off their European tour this Friday. Most of the tour will be in support of CULT OF LUNA, some are headline shows and festival appearances and there’s also new confirmed shows in support of MASTODON! 12.04.2013 CH LA CHAUX DE FONDS Bikini test w/ Lo! 15.04.2013 FR LE HAVRE Mad Daid’s w/ Lo! 22.04.2013 CH FRIBOURG Fri-Son w/ cult of luna, Lo! 23.04.2013 IT MEZZAGO Bloom w/ cult of luna, Lo! 24.04.2013 IT ROME Traffic Live Club w/ cult of luna, Lo! 25.04.2013 IT MISSANO Adriatico Blvd w/ cult of luna, Lo! 26.04.2013 CH WINTERTHUR Gaswerk w/ cult of luna, Lo! 27.04.2013 HR ZAGREB Club Attack w/ cult of luna, Lo! 29.04.2013 RO BUCHAREST Silver Church w/ cult of luna, Lo! 30.04.2013 RO TIMISOARA Daos Club w/ cult of luna, Lo! 01.05.2013 HU BUDAPEST A38 w/ cult of luna, Lo! 02.05.2013 AT INNSBRUCK P.M.K. w/ cult of luna, Lo! 04.05.2013 DE MARBURG KFZ w/ cult of luna, Lo! 05.05.2013 DE MUNICH Kranhalle w/ cult of luna, Lo! 06.05.2013 DE STUTTGART Universum w/ cult of luna, Lo! 07.05.2013 DE BIELEFELD Forum w/ cult of luna, Lo! 08.05.2013 DE COLOGNE Gebäude 9 w/ cult of luna, Lo! 09.05.2013 NL ROTTERDAM Baroeg w/ cult of luna, Lo!